TM Error Logger is a Macintosh Time Machine error reporting program. Checks for recent backup errors. 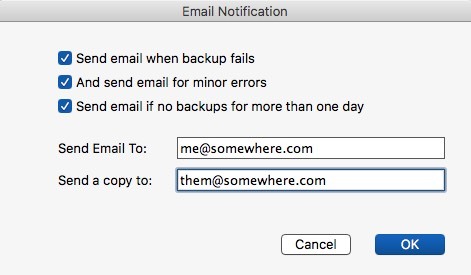 Sends an email notification when there is a Time Machine backup problem. Do you get those Time Machine Error alert messages and wonder why? Would you like to find out exactly what caused the error so you can do something about it (or just ignore it)? Run TM Error Logger after you get the Time Machine error and you will get a report showing which file or folder caused the error. Click on "Open Problem Folder" to reveal the folder containing the problem. TM Error Logger will poll the system log every 30 minutes looking for Time Machine Errors. You can update the window immediately by clicking "Current Log" . 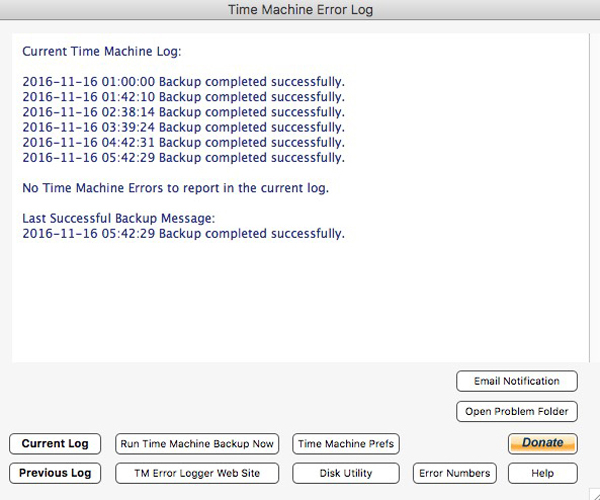 Leave TM Error Logger running 24/7 and it can send an email to you when Time Machine gets an error. Carnation Software has been providing Macintosh terminal emulation since 1989. We specialize in terminal emulations for Wyse 50, Wyse 60, Wyse 370, ADDS Viewpoint, Esprit, Televideo 925, DEC VT100. VT220 and Prism - connecting Macs to host computers running systems such as PICK, UNIX, Linux, Windows NT / XP, uniVerse, UniData, GA, Prime, Ultimate, McDonnell Douglas, Xymox, Metropolis, Page Digital and more. Compatible with MacBook, PowerBook, TCP/IP, telnet, ssh secure shell, Ethernet, Open Transport, Serial port, Modem, Appletalk and AppleScript. Multiple sessions and OS X are supported. Our most popular terminal emulation program, MacWise was written specifically for Mac OS X.
Icon Pallet launches programs and documents, and accesses folders with a single click. Stores over 600 programs, files and folders on one pallet on your Mac. iPhone app, Say it & Mail it records and emails voice messages from your iPhone or iPod Touch to yourself or to others. Copyright 1990 - 2009, Carnation Software. All Rights Reserved.